I have sent you an email and you have 48 hours to contact me with your address. 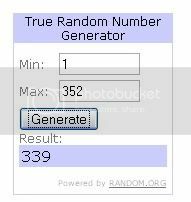 If I do not get a reply from you within that time, I will draw a new winner. Wow! I won, I feel like I've won the lottery! Thank you Perry! Congratulations Niki! Have fun with all the new stuffs!